Free Shipping Included! Buffalo Industries (92002) Painter's Spill Kit by Buffalo Industries at Beaver County Collision. MPN: 92002. Hurry! Limited time offer. Offer valid only while supplies last. This portable quick response Painter's Spill Kit fits conveniently behind seats in work vehicles and can be placed in multiple job-site areas. This portable quick response Painter's Spill Kit fits conveniently behind seats in work vehicles and can be placed in multiple job-site areas. 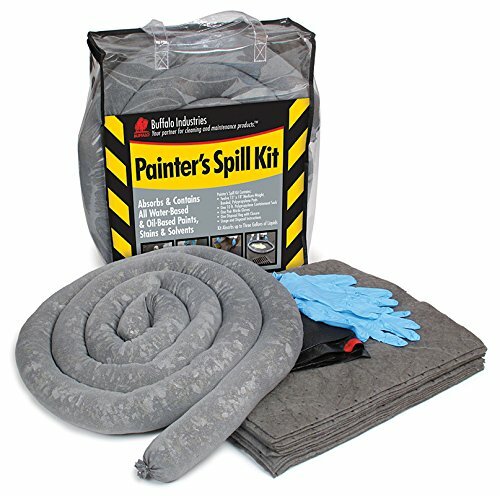 Consumers will also appreciate the ease-of-use and peace-of-mind from having a Painter's Spill Kit for accidental spills in and around the home. Polypropylene pads and socks absorb and contain all water-based and/or oil-based fluids. Kit absorbs up to 5 gallons of liquids. This kit contains 12 Medium Bonded Pads, 1 - 10' Sock, 1 disposal bag, 1 pair nitrile gloves, and instructions. This Spill Kit helps in compliance with the EPA's 40 CFR Sec. 112, regarding Spill Prevention, Control and Countermeasure (SPCC). The Kit also helps in compliance with Storm Water Regulations, EPA 40 CFR Sec. 122. Dispose of used sorbents in an approved container or collection site.